In 2014, I had just graduated high school. I was preparing for college at my dream school, Michigan State University. I was ready for a summer of graduation parties and beach days before I moved to East Lansing in August to pursue a nursing degree. Everything was looking excellent until July, when my mother was diagnosed with cancer. I was more than willing to give up beach days to sit with my mom in the hospital, anything as long as she would be alright. 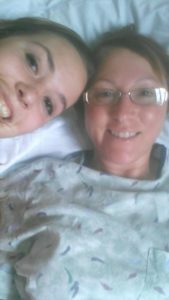 By the time I began my freshman year, my mother had already recovered from surgery, and was healing quickly. Looking back, I can’t believe how lucky I was. My mother recovered quickly and completely, all in one summer. This experience is what gave me the idea for this project. To see if students, like my self, who had ever had a parent diagnosed with cancer, struggle more than other students. If so, what are their support systems? How can we–as a college–support them as well? To create this project, I interviewed three young ladies who either attended or are attending Michigan State University. Each of them had their mother diagnosed, like my own, with a form of soft tissue cancer. I interview each of them, asking about their home towns, their family, and their college experience. Then, I asked them where they looked for support while going through this trying time. My first Interview was with Grace Smith. Grace was a recent MSU graduate, having earned her psychology degree in the Spring of 2016. Her mother was diagnosed with Stomach cancer the summer after her freshman year of college. Grace is a small town girl, with a big heart. She is enthusiastic, kind, and very social. Her best friend is her younger sister Kate, who attends Michigan State. Grace works hard and often, working with patients recovering from traumatic brain injuries. She is hoping to get a Master’s Degree in Speech Pathology. When I interviewed Grace, she seemed very nervous to talk about the subject of her mother’s cancer. She started out fairly calm, telling me about her family and friends back home. While she is closest to Kate, Grace also has many cousins she is close too. Growing up, these were her best friends. Grace, Kate, and their cousins Monnie, Ria, and Larry often spent their days walking from Grace and Kate’s home to their cousins farm, their aunts pool, their grandma’s pond, and then back again. 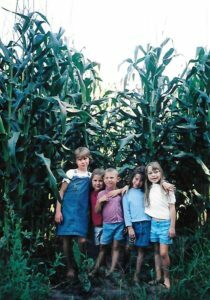 In order from left to right, Monni, Kate, Larry, Ria, and Grace Smith pose for their grandmother while playing tag in the corn. Photo courtesy of Peggy Smith. Leaving for college wasn’t too difficult for Grace, as she was only about an hour and a half drive from home. She quickly made friends with her roommate and the others on their floor. Each was in ROTC, many planning on being nurses like Grace.Still, on some weekends she would visit home. After her second semester, she came home for the summer, taking a waitress job at a bar called the Driftwood Here she worked alongside her cousin Monica. Things seemed to be going well. One summer night Grace got home late from work. Usually, after a late shift, she would get home, go into her parent’s room and tell them she arrived safely, then go upstairs to sleep. Her parents and Kate were usually asleep by then. This time was different. When she walked through her door, her mother, father, and sister were all waiting for her. Kate wouldn’t even meet her eyes. Her father told her that what he was going to say would sound like a sick joke, but it wasn’t. Her mother had cancer. Grace dropped to the floor. Her father tried to help her up, but she just laid on the floor and cried. Things moved quickly from then on. Her mother had stomach cancer, and though it was beginning stages, it was known to be a quick, silent killer. The doctors assured the family that the discovery had been a miracle, as most often nobody survived this cancer because it was never found. The family counted their blessings, and in July, Heidi Smith had her surgery. 80% of her stomach was removed to ensure all of the cancerous cells were removed. The day of the surgery was the day Grace decided she couldn’t be a nurse. She watched as the anesthesiologist struggled with her mother’s pain killers, causing her more pain. Her mothers back muscles were too tight to get the needle between her vertebrae, so the needle kept stabbing her back, but no medicine was injected. Grace wasn’t just sad watching her mother in pain, she was angry. Furious tears began to pour out of her eyes, and she knew she was seconds away from screaming at the doctor. Seeing this, Kate grabbed her older sister, and after promising their mother they would see her when it was over, she took Grace outside. Grace Smith poses with her mother Heidi Smith 2 days after her mother’s surgery. Photo courtesy of grace Smith. When I asked where Grace looked for support during her mother’s treatment, she quickly confirmed it was her parents, and her sister Kate. Knowing how much family meant to Grace, I wasn’t surprised. I was surprised, however, to hear she found comfort in her paternal grandparents. However, after getting the chance to meet them, it really wasn’t that surprising. They are wonderful people, who are both caring and open. They know everything that goes on within the family, and offer aid to everyone. They welcome stranger’s without question. Grace visits them almost every time she visits home. The next two girls I interviewed were sisters Emily and Jenna Pryor. These two are both sophomores at MSU, from Virginia. Emily majors in Criminal Justice and participates in ROTC, while Jenna majors in Social Work. The two of them have four other siblings, including the third Pryor triplet. Their parents are now divorced, and their mother has remarried. They where in Michigan attending college when they heard of their mother’s cancer. It was stage four soft tissue cancer in her abdomen, and completely unexpected. The following is a portion of my interview with Emily Pryor. When asked, Jenna said it was Emily she leaned on the most. Emily responded that she, in turn, leaned on Jenna. Both expressed thankfulness that the other was there, so they could place the burden on each other rather than their mother. According to Jenna Pryor, her brother Tyler did not take it as well. Where she and Emily were careful not to express concern too their mother, Tyler leaned heavily on their mother for support. While Jenna and Emily were focused on avoiding the “what if’s”, their brother seemed hung up on them. “He asked her to make him a voicemail,” Jenna told me, wiping tears from her eyes. Worried that she would die and he wouldn’t get to hear her voice again, he had asked her to send him a voicemail that he could listen to if that happened. I had the opportunity to meet the Pryor’s mother as well, when we attended a formal dinner for ROTC. She was a very kind woman who was not shy or soft spoken, and she seemed in very good health, especially considering her recent ordeal. Fortunately, none of my participants lost their mother’s. Grace’s mother placed third for women in a Five Kilometer race almost exactly a year after having 80% of her stomach removed. 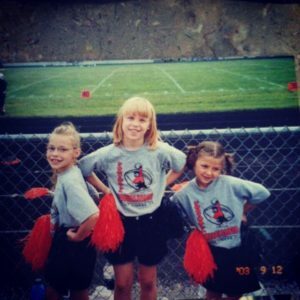 Jenna and Emily say that their mother, also an avid runner, has finally recovered enough to begin training again. Her recovery took much longer than Grace’s mother, as she required Chemo Therapy on top of the surgery. So, at this point in my research, I have spoken to three different students, all of whom had a mother diagnosed with soft tissue cancer. As far as support, none of them reached out to any college group, or really even to their friends. Each of them found support in their family. More specifically, they found support in their similarly aged siblings. Now for my story. When I began this research project, as I stated above, my mother had already been diagnosed with soft tissue cancer. This, however, happened when I was in high school, therefore I was not in the same category as Jenna, Grace, and Emily. That has recently changed. As of now, my mother has had a second confirmed cancer diagnosis, as well as a procedure to remove an additional growth that was categorized as pre-cancerous. This means that though technically the tissue was not cancer yet, it would become so if not removed. The first time my mother had cancer, I looked to her, my father, and my elder sister for support. Now I find myself doing this once again. The same night my mother called me to tell me the results of her biopsy, my sister drove to campus to pick me up. She pulled up in front of my class and took me to dinner. While on the way, she told me she had cancelled her plans with her boyfriend. “I told him I just need my sister, I just wanted to be with you,” my sister told me as we left campus. I was grateful, because I needed her just as much. So once again, we find that the most common support group is family. But what about other research? What have other researchers found when they looked into such topics? In all honesty, I found it very difficult to find research about college students who’s parents had received a cancer diagnosis, or their coping methods. Most studies had to do with children whose parents had received cancer diagnoses. That being said, I did find a few studies that provided some insight. The first was “Adjustment of Children and Adolescents to Parental Cancer Parents’ and Children’s Perspectives.” This article by Amy Welch was published in Cancer. Amy and her team were trying to gauge the emotional effect cancer had of the children of those diagnosed with such. One of the major findings in the study was that a very high number of participants showed signs of anxiety, aggression, or depression after the diagnosis. While children reported feeling very low levels of such, as did parents, adolescent levels were higher, especially in females. That is to say, the adolescents are reporting feeling anxious or depressed, but the parents aren’t noticing it. What the findings of this study suggest is that even though the parents don’t see the mental and emotional strain the adolescent is feeling, there is a high likelihood that the child is feeling it. This is conducive to my own research. Even though Jenna and Emily were worried about their mother, especially because of their distance from her, they didn’t share their thoughts aloud with her. I didn’t really lean on my mom too much for support just because I knew she was already going through all of this. I didn’t want to put more pressure on her and feel like she was failing us in any way or like, that she needed to do more. Just because I wanted her to, you know, save her strength for what she needed it for. Grace as well, found other outlets for her stress, leaning on her father, her sister, and her grandparents. Personally, I leaned on my father and sister. I also remember leaning on my uncle, the husband of my father’s sister. He is a particularly gentle soul. My aunts first husband was highly abusive, and my new uncle is far kinder to aunt, giving her the kind treatment she deserves, especially after seventeen years in an emotionally and physically abusive marriage. I remember the first time my mother was diagnosed with cancer, my father and I went the quarter mile down the road to talk to my grandparents, while my mom was consoled by her elder sister and brother in-law. Almost as if everyone knew something was wrong, cars pulled into my grandparents driveway. My uncle, after hearing of the diagnosis, pulled me into a hug, then sat with me, telling me that everything would be alright. As far as anxiety goes, I never really considered that my mother’s diagnosis may have been what caused (or helped to cause) my own. I didn’t make the connection that it didn’t start until after my mother’s cancer had been realized. I suffer many symptoms, the severest of them being brain zaps. These are momentary lapses in brain activity, almost like a glitch. they are caused by high anxiety. Essentially, my brain will go into a brief anxiety overload, and panic. The smallest ones simply leave me momentarily dizzy, while the most severe can quite literally knock me off my feet. The zaps are harmless, if annoying, and have lessened with the use of a small device that releases scented oils into the air while I sleep. Above is the link to Amy Welch’s research involving children and adolescents emotionally dealing with their parent’s diagnosis courtesy of Michigan State University Libraries. The second article that applied to my research was by Jacqueline Barnes and her team. This is titled Qualitative Interview Study of Communication between Parents and Children about Maternal Breast Cancer. This article was published in the British Medical Journal. The link to the PDF is below, courtesy of British Medical Journal. This article specializes on the communication between the diagnosed mother and the child, and the effects it has on the child’s understanding and concern about the illness. It shows a correlation between anxiety in the children and lack of communication with the ill mother. The study emphasizes the importance of communication. We, as humans, notice negative changes in our atmosphere. Communication is important, so that the child does not begin to believe the negative reactions are a result of them or something they have done. In addition, it it beneficial for the mother to know that is cared for though her struggles. This leads to the conclusion of my research. I have reached the conclusion that, when a college student has a parent suffering from cancer, family is the number one support system they turn to. Specifically, the turn to family members with an equally close relationship to the parent as they do, i.e. siblings or another parent. Grace leaned on her sister Kate and her father, and I leaned on my sister and our father as well. Emily and Jenna Pryor leaned on each other. Though Jacqueline’s research shows that communication between the parent and the child is important, it tends to be avoided due to concerns of causing stress on either the child or parent. So, what can our campus do to help? I recommend holding seminars for both parent and child, where they can communicate effectively in a safe space not only with each other, but with those going through the same experience. I know, as someone struggling with this myself, that talking to these girls who are struggling just like me was extremely helpful. It was relieving to see that there were other girls in my situation, who understood how I was feeling. It also adds an additional support group. Special thanks to Grace Smith, Emily Pryor, and Jenna Pryor, for participating in my research, allowing me to complete this project. Cancer.” (2000): n. pag. The BMJ. Web. 24 Jan. 2017. Parents’ and Children’s Perspectives.” CANCER 77.7 (1996): 1409-418. Wiley Online Library. Web. 24 Jan. 2017.